The following research was conducted by Brandon Nightingale in 2018 and is used with his permission. 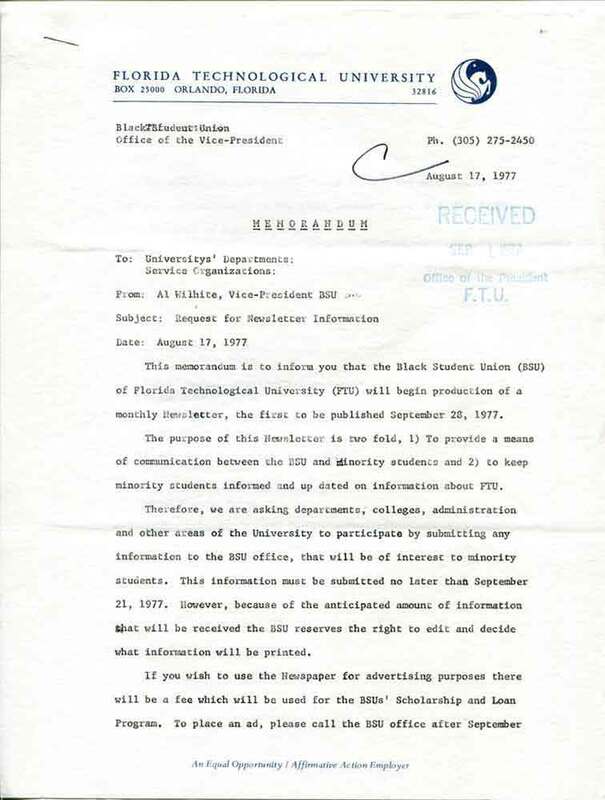 Images are courtesy of UCF Special Collections & University Archives. 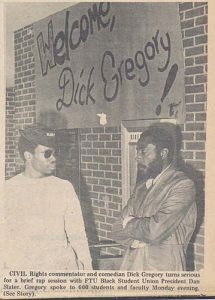 In the late 1970s, the Black Student Union began to face hard times. 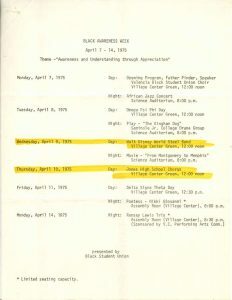 During the fall of 1977, they were forced to cancel all events due to the lack of funding from the Student Government. In a meeting with two members of the BSU and 3 members of administration on campus, the BSU threatened to stage a “sit-in” during the FTU Open House on November 6 if administration didn’t approve their list of 20 demands. 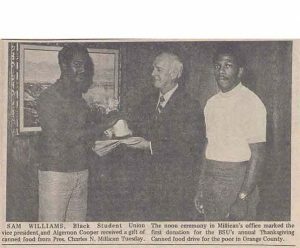 The demands included getting funding from the Student Government and establishing a black studies program on campus. 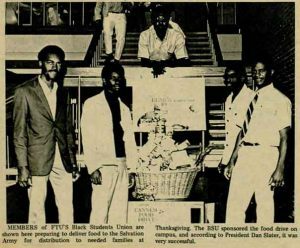 The BSU had been an active organization on campus that provided services for all students on campus. 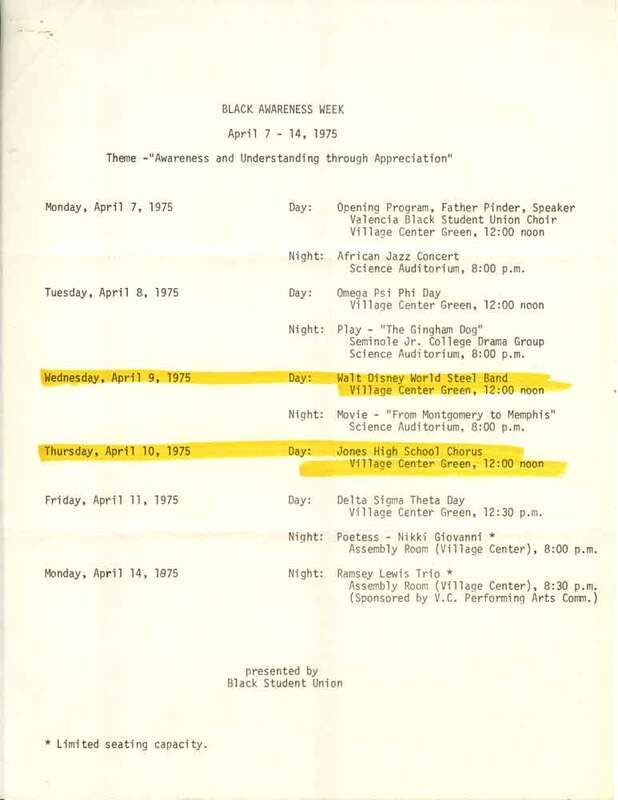 Despite not having much money, over the years the BSU brought civil rights leaders to campus and created events for students on campus to attend. (1982). BSU Celebrates 14th Anniversary. Central Florida Future, 15(10), 29. Smith, N. (1969). Blacks Form FTU Group. Central Florida Future, 2(5), 8. (1969). Black Student to Aid Needy. Central Florida Future, 2(7), 4. (1969). Black Studies Accepted Despite Walkout by BSU. Central Florida Future 2(10), 1. (1970). Minority Groups Are Represented. Central Florida Future, 2(21), 2. (1970). Black Liberation Week: Tribute to Malcolm X. Central Florida Future, 2(18), 1. (1972). 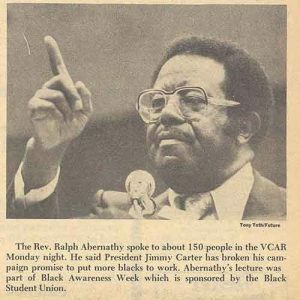 Black Student Union Salutes Afro-America. Central Florida Future, 4(22), 3. (1977). BSU Forms New Committee to Plan Cultural Programs. Central Florida Future, 9(20), 9. (1977). BSU Provides Services: Stover. Central Florida Future, 10(7), 7. 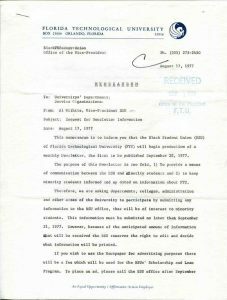 University of Central Florida Office of the President: H. Trevor Colbourn Presidential Papers 1948-2006, (Box 3, Folder: Afro-American Studies, 1969). Special Collections and University Archives, University of Central Florida, Orlando, FL. 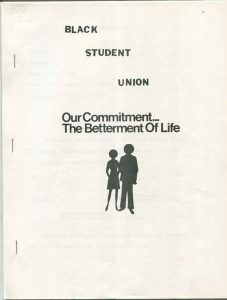 Holfe, R. (1977) Administration Okays BSU’s proposals. Central Florida Future, 10(11), 1. Kilsheimer, J. (1978). Black Student Union Finances to be audited by SG Accountant. Central Florida Future, 10(29), 1,6. Kilsheimer, J. (1978). Audit Clears BSU of Violations. Central Florida Future, 10(33), 1. Barry, A. (1978). A&SF Supplement Up in the Air. Central Florida Future, 11(3), 1. Gugel, D. (1978). Omara Suggests formation of Minority Student Group. Central Florida Future, 11(9), 1. Omara, M. (1978). Concern over BSU with ‘Legitimacy’ of Leaders. Central Florida Future, 11(10), 8. Cheves, V. (1979). BSU Resolves Problem of Communication with SG. Central Florida Future, 12(9), 1. (1979). Black Students to Organize Choir. Central Florida Future, 12(2), 4. Gugel, D. (1980). Blount, Marchena Win Election. Central Florida Future, 12(29), 1. Hawley, K. (1981). Governor Appoints UCF Student to BOR. Central Florida Future, 14(4), 8. Lee, M. (1989). AASU Selects Sherrod to Continue Positive Influence. Central Florida Future, 22(10), 1. Green, V. (1989). BSU Becomes AASU at Convention. Central Florida Future, 22(10), 1. Stoker, M. (1990). UCF White Union May Form. Central Florida Future, 22(60), 1.